This month I will take a break from the bad news about the environment. In January, I wrote about presidential transitions at the Department of the Interior. In March, I wrote about protecting your career at the EPA. Last October, I wrote about nuclear weapons in Korea, and, in February a year ago, I wrote about Nuclear Winter. We need to lighten up. In 1961, when I was a college student, I got a summer job working as a laborer for the National Park Service in Yosemite. I got it the old fashioned way – my father’s connections in Washington. My image was that I would repair trails in the high country or I would help the rangers with important projects. Instead, when I got there I was assigned to the garbage incinerator in the Valley. Every day, workers would collect garbage from the campsites and roads and bring it to our facility in the Village for burning. First, we sorted out tin cans and trash which would not burn. Then, we would shovel the combustible trash down into the furnace burning beneath us. It was unsanitary, smelly and polluted the air. Even at the time, the Park Service considered the incinerator an embarrassment. We soon figured out that workers with appointments from Washington got the bad jobs and those from California got the good jobs. In other words, Democrats from the new Kennedy Administration sorted garbage and Republicans held over from the Eisenhower Administration maintained the trails and helped the rangers. One of my coworkers sorting was recommended by the Speaker of the House, Sam Rayburn. In the winter, he worked on Congressman Rayburn’s ranch in Texas. Other co-workers were recommended by senators and representatives from Massachusetts to North Carolina. Even patronage has its checks and balances. Despite the squalid duties, life in Yosemite had many compensations. 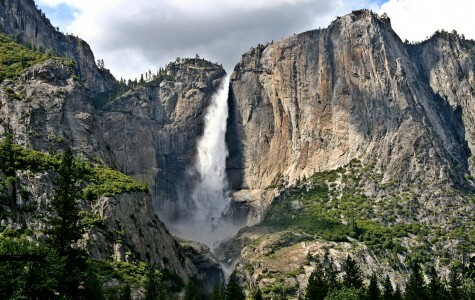 The incinerator was located at the foot of Yosemite Falls which roared above us. One day, a bear and her cub wandered in for a visit. We bought film at Ansel Adams’ photo shop while he developed his famous prints. On my days off, I would hike from the Valley floor up to the rim. Other days, I would hitch-hike to the high county. Once I went to the O’Shaughnessy Dam where I learned it had destroyed the beautiful Hetch Hetchy Valley. We swam in the Merced River and went to dances at Camp Curry. At dusk the rangers built a bonfire at Glacier Point and pushed the embers off the 3000-foot cliff. Author: Eighteen years after this summer, Davis held a GS 15 position in the Department of the Interior. Email him at [email protected].